Head Start: What Do We Know About What Works? The Jobs Evaluation: How Well are They Faring? AFDC Families with Preschool-aged Children in Atlanta at the Outset of the Jobs Evaluation Vulnerable Youth and the Transition to Adulthood: Second-Generation Latinos Connecting to School and Work 13 Indicators of Quality Child Care: Research Update Child Care Quality: Does It Matter and Does It Need to be Improved? Preschool enrollment increased among Black children, and the Black-White enrollment gap in 1995 (for three- and four-year-old children) was no longer present in 2011. The Asian-White enrollment gap for three- and four-year-old children was also significant in 1995 but not in 2011. Latino children’s participation in preschool also increased, narrowing the Latino-White gap, but Latino preschool enrollment rates remained lower than all other racial/ethnic groups across this time period. It is worth noting that the increases in Black and Latino children’s preschool participation occurred only among four-year-olds (with no statistically significant increases for three-year-olds). The percent of children enrolled in public preschool was highest among Black children, followed by Latino children, and then White children. The percent of children enrolled in private school, in contrast, was highest among White children, followed by Black children, and then Latino children. This is due largely due to a non-significant increase in Asian enrollment. Note that large standard errors associated with Asian estimates cause even seemingly large differences to be statistically insignificant. 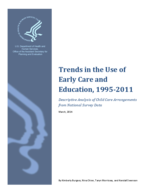 Among Asian three-and four-year olds, preschool enrollment was 38 percent in 1995 and 49 percent in 2011; among three-year-olds only, 25 (in 1995) and 38 (in 2011) percent; and among four-year-olds only, 55 (in 1995) and 61 (in 2011) percent. None of these differences were statistically significant. Asian enrollment was not statistically significant from 1995 to 2011 for either three- or four-year-olds. However, the pattern of greater increase among four-year-olds compared to three-year-olds was not observed – even in terms of nonsignificant trends – among Asian children.